The ideal companion for the summer: the cooler bag. 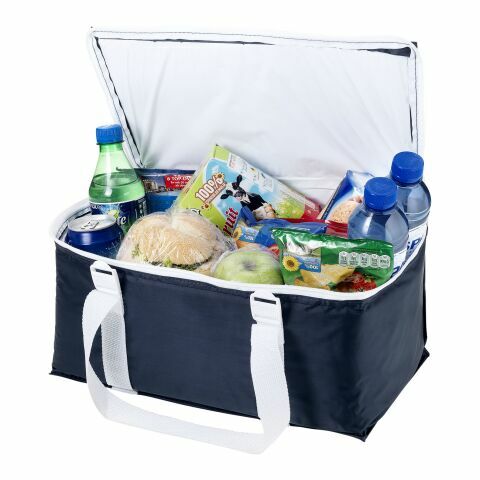 As an accessory with commercial value, the cooler bag will accompany you through the summer, on bicycle tours, trips to the beach or a picnic at the park! In the allbranded online shop you can print this commercial quality promotional products with a logo or slogan so as to draw attention to your company. With the professional and eye-catching imprint of allbranded, your brand will be easily spottable in the summer, just in time for the most productive season of your business. Browse in the category of "cooler bags" for the ideal advertising medium for your brand, blend it in your corporate colours and print or embroider the cooler bag with your company logo! Also check out our other accessories that work all year round such as; pens, printed pencils, mugs, umbrellas, custom lanyards, folders, usb-sticks, printed drawstring bags and keyrings! Cooler bags branded with your company logo and slogan benefit from great advertising. The nice and cool beer at the beach, the fresh salad during a barbecue or the delicious sandwich on a bike tour - all this would not be so if not kept fresh with a portable fridge. Even the long drive to your vacation becomes bearable if equipped with eco-friendly cooler bags and a few relaxing breaks at resting spots. Thanks to the useful storage and quality (due to its 600d polyester) food is kept cool and crisp during commute. Printed with your brand, the cool bags from allbranded are the perfect promotional gift (as are our pens, bags, mugs, usb-sticks and keyrings) for all outdoor lovers and connoisseurs in terms of taste. These printed bags offer large space for drinks, fruits, vegetables, sandwiches and much more. In three trendy, colorful designs, it not only looks appealing, it also provides the perfect advertising space for your very personal message to your customers and employees. The bags find their application in leisure time, sport and travel. Thanks to insulation and the insertion of cooling packs, they produce cool temperatures in the summer and protect from the heat. The thicker the heat insulating layer of aluminum, the more effective the protection. Customise the cooler bags from the allbranded online shop to your brand as integral part of the everyday life of your (potential) customers, employees or business partners. Eco-friendly cooler bags have a clear commercial value. Thanks to their unique function, the likelihood of regular use is high like our range of custom backpacks, keyrings, pens, mugs and folders. Distribute these promotional products and allow your company a permanent presence in the vicinity of your target groups. In addition to pens, pencils, mugs, umbrellas, usb-sticks, folders and keyrings, these promotional products look very exclusive. They are of high value and stand out from the mass of common promotional gifts. We recommend the seasonal use of eco-friendly cooler bags, since this product works its commercial value the most during the summer. Thus, the advertising impact of these are significantly higher during the warmer seasons. Your customers, employees and partners will be reminded of your business, thanks to the expressive and eye-catching advertising. If you want to advertise subtly, an advertising application on the handle or on the zipper of the zipper is a good idea. You can advertise with your logo more directly on the front of the bag which pens it strongly into memory. Configure your perfect promotional item directly online at the allbranded shop. Specify the preferred colour and quantity as well as the desired printing technique. Advertising products must be individualised to create recognition value for your brand. This is why an individual and corporate design printed on the cooler bags is important, so that not only the product stands out through it's particularly noticeable aesthetic but also speaks directly to your brand.